There's no need to travel far once you arrive at Balangan, there's so much to do and see close by. The village of Rock is set on the Camel estuary frequented by sailing, surfing and golfing enthusiasts. It is ideal for all generations. Golden sands stretch north to Daymer Bay and South to Porthilly Cove, which is within walking distance of Balangan. We are situated in a quiet position on the edge of the village and approached by a private lane that runs on across the golf course onto the coastal path. This path will lead you to the beach at Rock where you can get the ferry over to Padstow. Those who would like a good walk follow the beach at Rock along to Daymer Bay, Polzeath and keep on walking on through Port Quin and up to the quaint fishing port, Port Isaac, and treat yourself to a cream tea or a pint of Doom. Theres a nice short circular walk through the famous links golf course of St Enodoc to the crooked-towered church where Sir John Betjeman is buried, and the golden sands of Daymer Bay then back along the beach to Rock taking in Porthilly beach where there is a beautiful church right on the waters edge. During the summer, sailing, waterskiing and fishing trips are available in Rock, while year-round, surf beckons at Polzeath. There’s a wide choice of restaurants, among many others there’s The Dining Room which is just a 5 minute walk, Nathan Outlaw in Port Isaac, Rick Stein at Padstow or Jamie Oliver at Newquay to the many character village pubs serving local produce. Or return to Balangan for a barbecue on the patio or eat in the light and spacious open plan living area. Balangan is a new house built to a very high standard. It has a lovely warm welcoming and friendly feel as soon as you walk in the door. Although you are right in the centre of Rock where you can walk to shops, beaches, restaurants and a pub, it is also very quiet and tranquil at the house which is set in its own garden along a quiet track and has plenty of room for parking. On the first floor, bathroom with bath and shower, wc and hand basin. Ensuite to master bedroom with shower, basin and wc. On the ground floor wc and basin, exterior shower for surfers coming of the beach. The beds will be made up ready for your arrival. You will need to bring beach and bath towels. Sitting-room with wood burner, television and DVD player, comfy sofas and double doors to outside patio. We do leave a small amount of milk and tea bags but we do suggest you arrange a grocery order. The local shops in Rock are also extremely good. The Club House for St Enodoc Golf Course is less than a mile along the road, with its two courses the Church and the Holywell there's golf for all abilities. There are a variety of other courses within 35 minute drive. Notes on accommodation: Facilities and services inclusive electricity eco-friendly passive and solar heat system with electric back-up. Logs for wood burner - first basket free there after purchase locally. hand towels. Outside: There's private parking for 2 cars. Garden with patio and garden furniture, barbeque. Small well behaved dogs by arrangement. Regret no smoking. Arr/Dep Friday Utility Room: Washing machine and drier in the garage Cleaning / Towels / Linen / Maid service: Beds will be made up for you ready for your arrival. You will need to bring bath and beach towels. If you stay for more than one week the property will be cleaned at the end of the week on the usual changeover day. Other: The garage has plenty of room for hanging wetsuits and storing equipment such as surfboards. Spacious ground floor with everything you needed; underfloor heating was great especially in March! Very clean on arrival, maybe couple more hand towels would’ve been useful, but as there was only 2 of us, no big deal. Loved location, great walks from front door; would book again! This is a lovely spacious and comfortable family house in Rock.We had a really great holiday here. 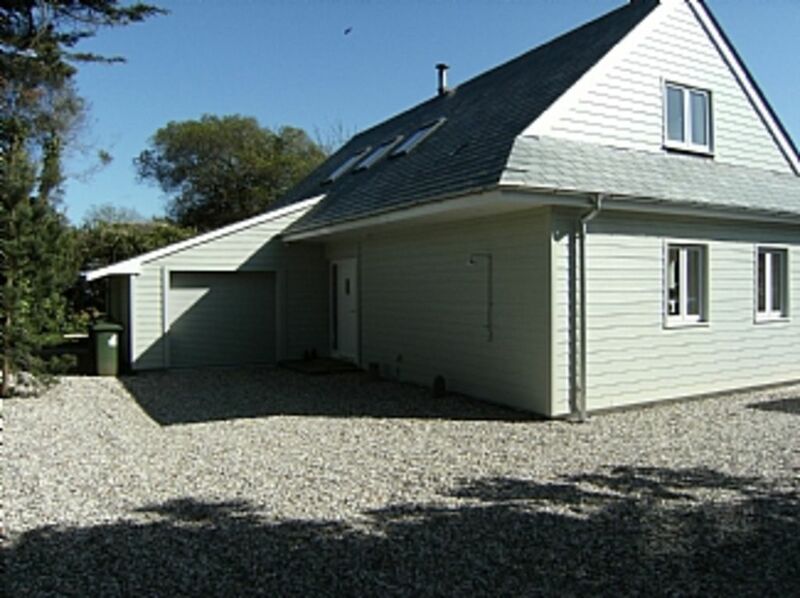 This house is in a really lovely location.We had a great holiday here and enjoyed visiting and walking through the beautiful cornish countryside. It was good to have the lovely bakery within walking distance! We had a great week. This house is very easy to live in, superbly designed great location. Would highly recommend for a thoroughly relaxing break. The house is wonderful. Large, spacious and perfect for small children and a dog! With a huge, enclosed garden which can be accessed via two sets of double doors, this family holiday home was perfect. Private driveway and location and with a short five minute walk to the local Deli, bakery, newsagents, fish & chip shop, butchers and fishmongers, you will not find a better place to stay in Rock. The beach is only a ten minute stroll, and staying in such a beautiful location, you'll never get tired of the surroundings. We will be returning in 2016. Just along the road is the secluded estuary at Rock, fantastic for water sports, with sailing, water skiing, windsurfing, kite surfing, kayak, fishing and swimming. A walk along the beach will take you to Daymer bay at the mouth of the estuary or keep going along the coast path to Grenaway with its rock pools and then to Polzeath famous for surfing and buzzing with cafes, restaurants and surf shops.